The original underwater tabletop skirmish game! 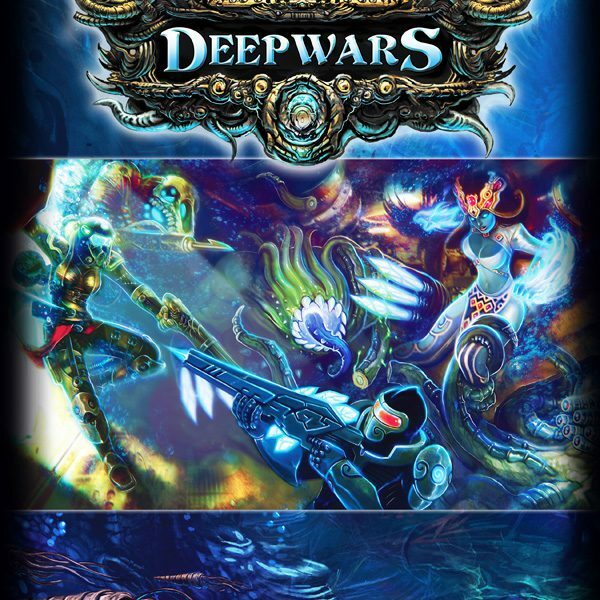 DeepWars is the only miniatures game where you can have tabletop battles below the waves of a lost underground sea in search of ancient treasures. 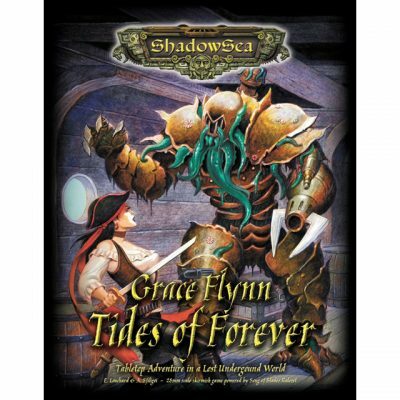 Players can choose from different distinct forces, from humans in steampunk dive suit to savage merfolk and mysterious high-tech warriors of Atalán. Games are played with small sides so players do not need to invest in massive armies, just specialized warbands of personality characters and troops, and can be played in an hour. 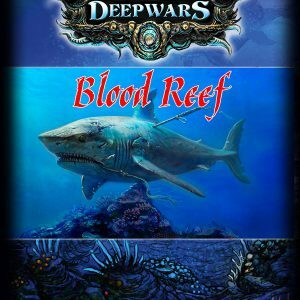 Take your forces into sunken shipwrecks, shark-infested reefs and lost cities in campaigns of multiple scenarios where each member of a warband can gain advancements as they win battles and gather treasure. 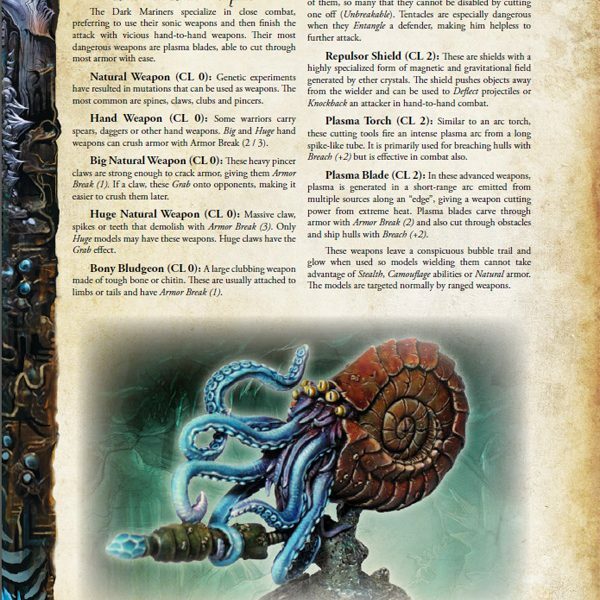 But beware of wild creatures that roam the Shadow Sea, as they have their own AI rules that allow them to hunt any model on the board, hungry for blood. 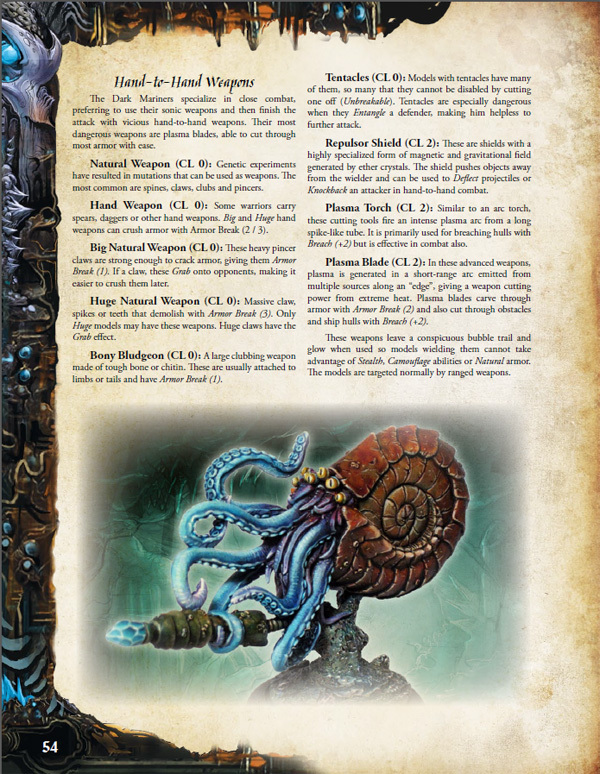 The book comes complete with all of the core rules as well as descriptions of all weapons, armor, tech artifacts, magic and special abilities for all characters and has the roster for the four main forces as well as all wild sea creatures. 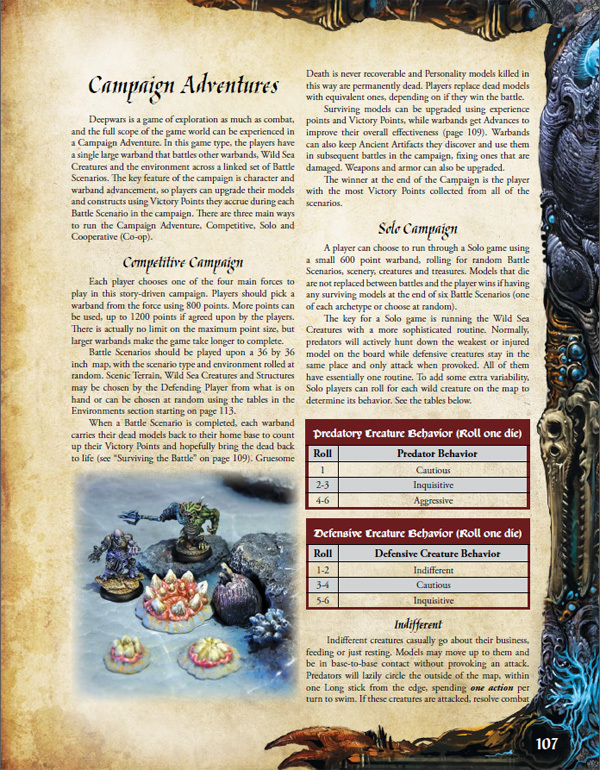 In addition, it includes a section detailing the different environments that players can explore and do battle within and descriptions of all of the different terrain types that can be encountered. Finally, there is a complete toolkit in the back that shows how to build your own custom characters or edit existing ones using a simple point calculation system. 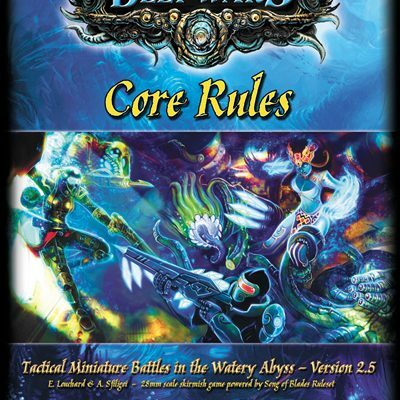 – RULES BASED ON AWARD-WINNING SONG OF BLADES AND HEROES by Ganesha Games but with extensive additional rules, weapons, armor, technology items (akin to magic items) and new combat and movement options. DeepWars include a detailed combat system and multiple combat options with wound tracking for different body part or subsystems. The activation system allows players to choose a basic free action or gamble on rolling dice for more complex actions. 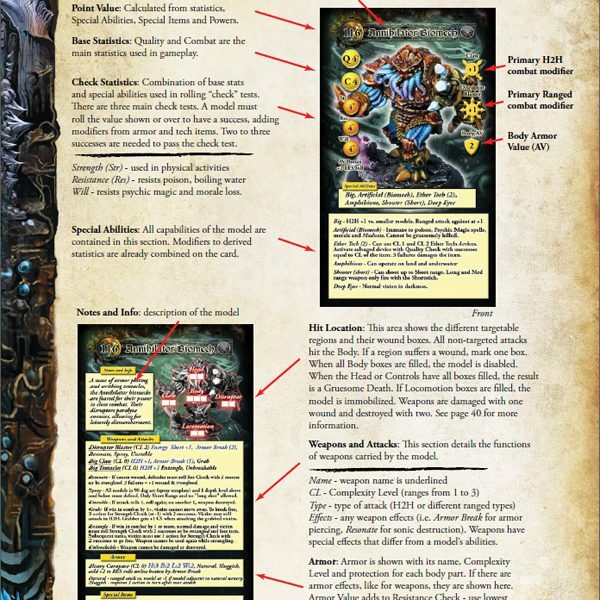 Game cards for miniatures are tarot sized (4.75 by 2.75 inch), giving room to include all of the descriptions of Special Abilities, Weapons, Armor and Tech Items. 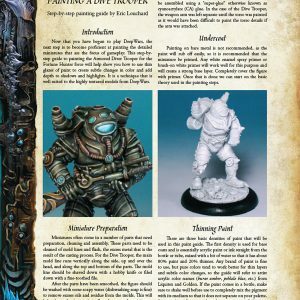 This means much less referencing the rulebook and faster gameplay for all. 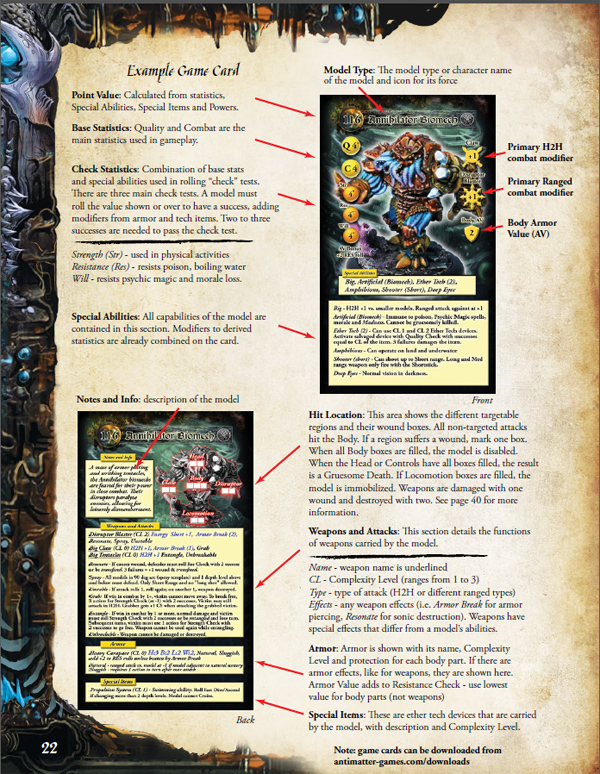 Sets of game cards can be downloaded in PDF format in the Download section of the website. 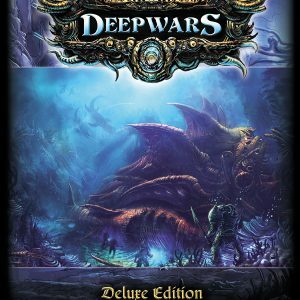 – 3D GAMEPLAY: In DeepWars, all models are capable of swimming or movement through the water column, which gives the game a distinct three-dimensional feel. Model can pass over and under each other using specific Depth Levels, which are indicated by markers or on a clear acrylic Swim Stand (available in the AMG store). Rules are included for movement across depth levels, where hasty changes in depth can cause deadly barotrauma. There are also rules for the effects of variable visibility and light levels and for models that can easily navigate through the darkness using echolocation. 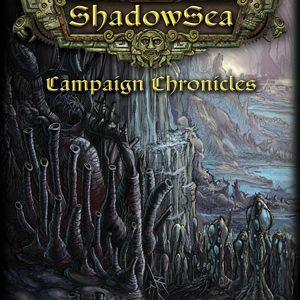 – INTENSE COMBAT, MAGIC AND TECHNOLOGY in the abyssal depths of the Sea. 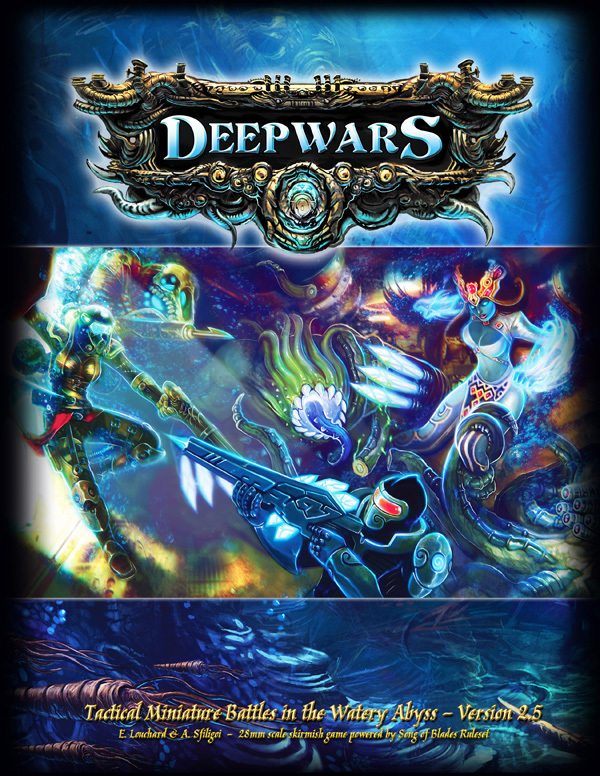 Breach submarines, uncover undersea temples, battle with schools of sharks and dodge torpedoes while recovering artifacts that hold the secrets of the ethereal void. Spellcasters can wield multiple magical spell types, including elemental magic that causes hydrothermal eruptions and dimensional magic that allows unsavory spellcasters to call forth beings from the ethereal void. Scientists can discover artifacts with tremendous power or design and improve upon their own ether technology to upgrade and create new items. 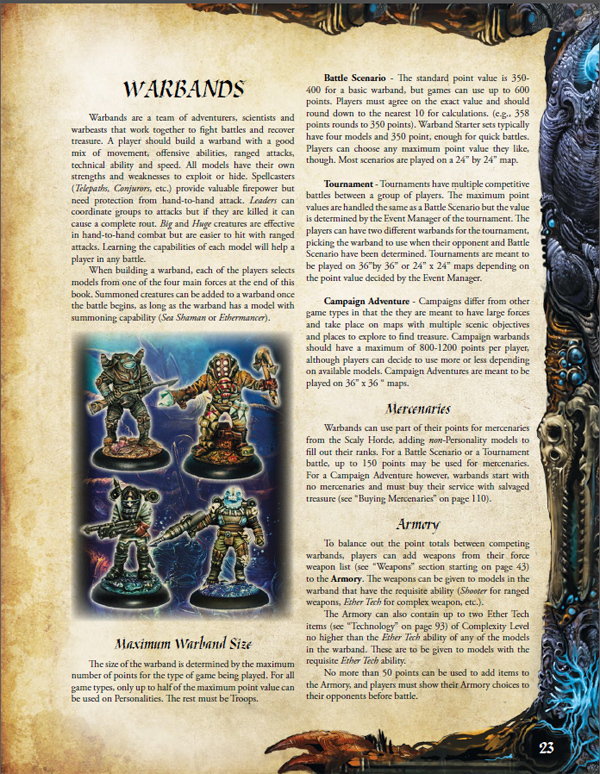 – SKIRMISH WITH RPG FLAVOR: Combination of 28mm scale miniature tabletop wargame with campaign advancement and a role-playing flavor. 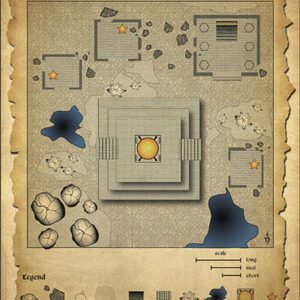 The game can be played in single sessions of an hour, or as a campaign where warbands salvage ancient technology, design their own new tech items, enhance abilities and generally become powerful lords of the deep. – FOUR COMPETING FORCES: Battle with four unique forces below the waves. 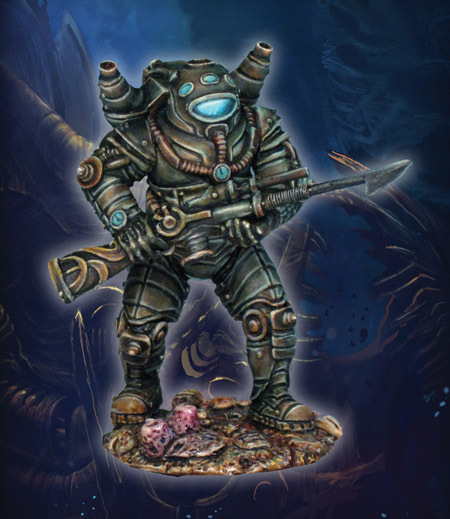 The human Fortune Hunters are encased in diving suits and utilize salvaged technology to help them control the seas. 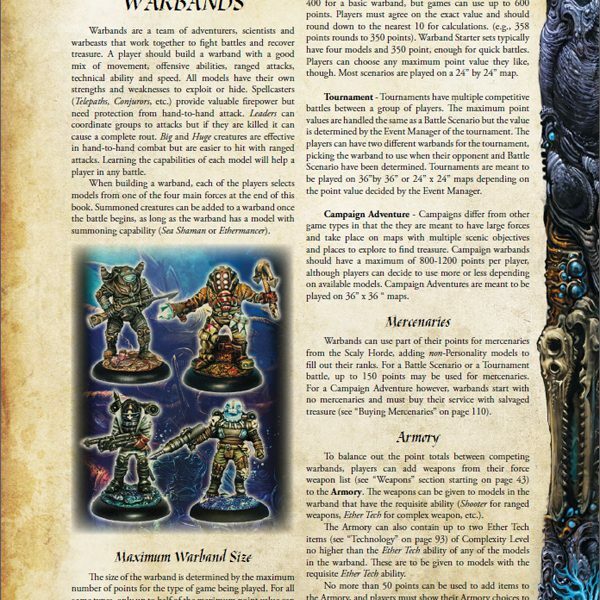 The Dark Mariners are corrupted beings that summon ethereal beings from the dimensional void. The Ancients of Atalán are the remnants of an advanced undersea civilization trying to reclaim their former glory. 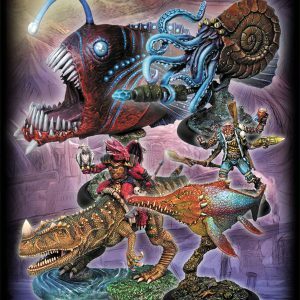 The Scaly Horde is a loosely organized faction of scaly draconids, fish-men and monstrous creatures that intend to expand their control of the sea, while earning gold selling their services to other forces. 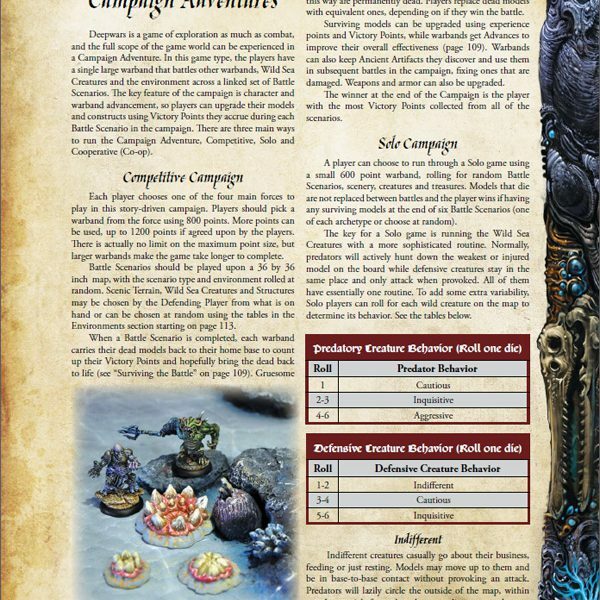 – TOURNAMENT RULES – The rulebook has an entire section on running tournaments, complete with scoring and timekeeping, as well as new Special Operations that each player gets for a scenario. 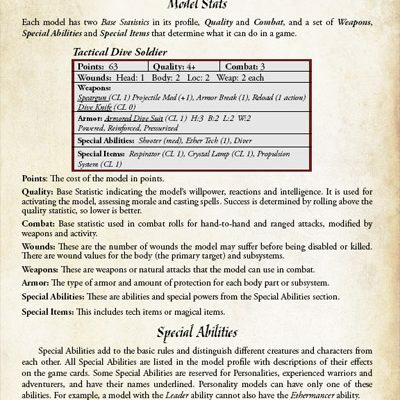 The Spec-Ops are special missions that a warband can accomplish during a scenario to gain bonus Victory Points.